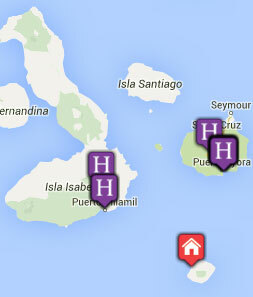 Tribes Overall: "I very much enjoyed the Galapagos 7 night tour on Beluga visiting Santa Cruz, Espanola, Genovesa etc. Each island was quite different. Wildlife excellent. The Beluga is a very comfortable boat. Our 4 night trip to Napo wildlife centre was not as successful. The lodge is fine but I was disappointed by the activities. I expected to see more wildlife on the canoe trips. What we did see was often far away. At the observation towers you really needed a telescope to see animals. Interesting to see the area but my feeling is that 2 days there would be sufficient. Quito is worth visiting, the Patio Andaluz is a lovely hotel in the old town." Guides: "All guides were helpful and they were always on time." Very noisy rooms. Traffic noise from the busy road was an irritation. The air-con was incredibly noisy too, with it on the traffic noise was not so obvious but .....We had a night flight but had to check out of our room at noon. It would have been helpful to have the room available all day. Nice lodge. 2 days there would be sufficient to see the area. Disappointing wildlife viewing. Great location, you can do some interesting walks around the historic centre. A guided city tour is well worth half a day, you are taken to some great view points. Lovely 2 storey rooms. Great service. Cabin 7 was super. Not much storage space so take soft bags that can be squashed under the bed. Nice to have huge windows to admire the view. Very attentive and helpful crew. "Wildlife and scenery in the Galapagos."